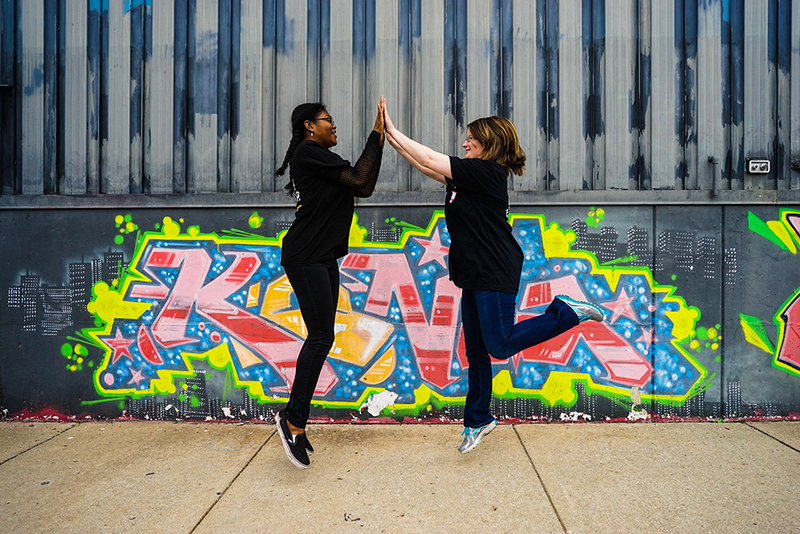 Katherine Messier, the Executive Director of Mobile Beacon, participated in buildOn’s 36 Hours immersion program in Detroit in May 2018. 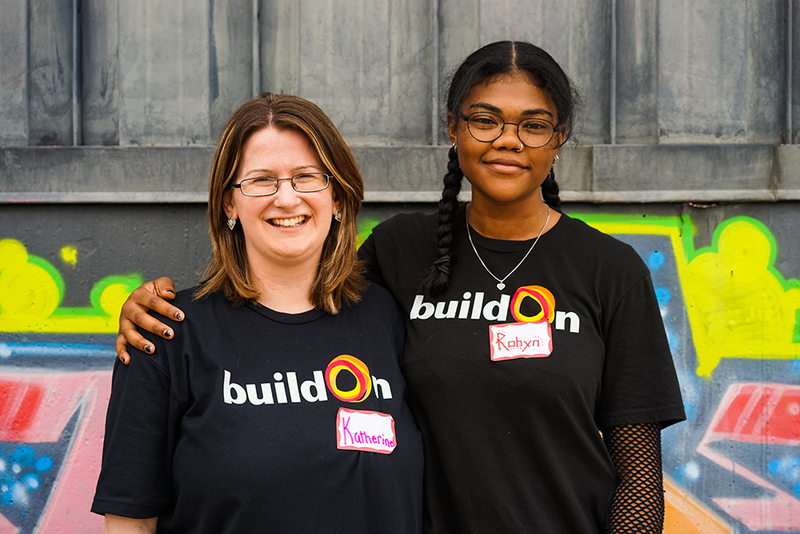 As part of 36 Hours, Katherine traveled to Detroit to meet and serve alongside buildOn students from Western International High School, and afterwards, she shared the following reflection with buildOn. To learn more about 36 Hours, click here. At 6:30am on Monday morning, I set out for Detroit to begin 36 Hours—an immersion program led by buildOn students—ready to learn about southwest Detroit from the very honest and personal accounts of students, teachers, and administrators and directly experience part of the change. 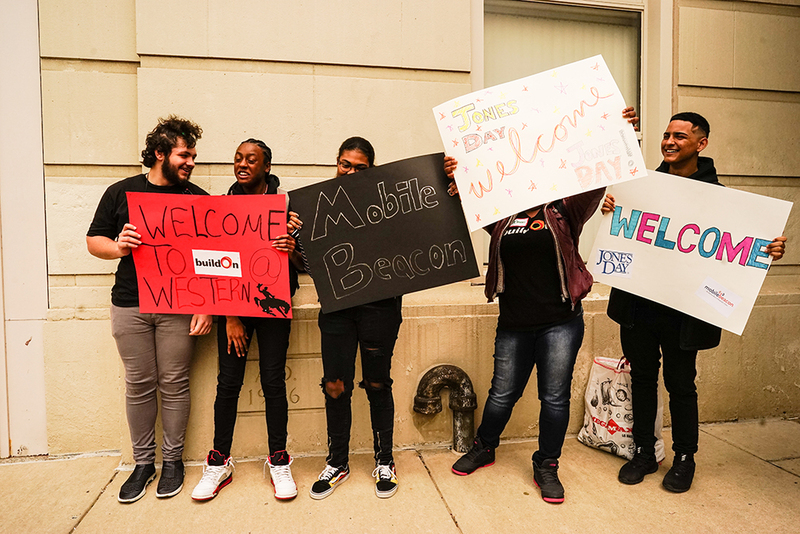 Above: buildOn students welcomed Katherine and the rest of the team from Mobile Beacon and Jones Day to Detroit. buildOn’s 36 Hours program pairs each volunteer with a Student Ambassador. My Student Ambassador was Robyn, a freshman at Western, who impressed me with her maturity and quiet determination. Out of the adversity she’s faced, Robyn has learned that service is the path to creating the change she wishes to see. More importantly, she’s actually making that change happen, along with 500 other buildOn students in Detroit every month. Robyn’s actually making that change happen, along with 500 other buildOn students in Detroit every month. 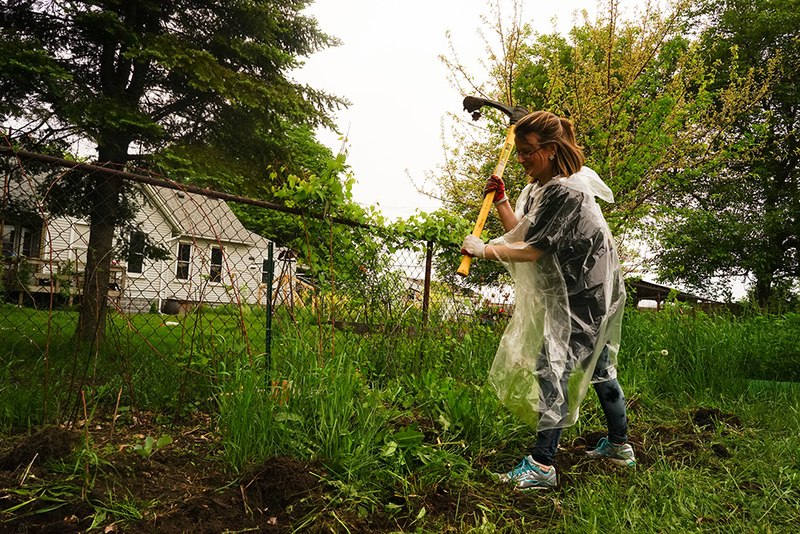 Our first service project brought us to the home of local powerhouse Raquel, a Detroit resident who is using her property to create a community garden. As part of this neighborhood beautification effort, our group set out first to paint two benches and telephone poles, and second to clear out grass and weeds (a task that quickly exposed my total lack of aptitude for gardening) to plant raspberries to be enjoyed by other Detroit residents. Although it was a “choppy experience” for both me and the grass, I’m proud to say that I can now use a pickaxe to clear a small area of land! Above: Katherine serves to clear grass and weeds at the Brandon Scotten Community Garden in Detroit so that the land can be used to grow raspberries for the local community. The following day, we met with teachers and administrators at Western who shared their own challenges in the face of low expectations, budget cuts, and seemingly ever-changing leadership. I admire their resilience and commitment to both their students and community. Then our buildOn Student Ambassadors held a round-table discussion and shared why they chose to lead lives of service and their plans to continue to develop themselves and their communities. Having witnessed the impact that these six brave, upbeat, and compassionate teenagers have made through the direct and positive way they confront challenges, I feel energized and compelled to follow their example. Having witnessed the impact that these six brave, upbeat, and compassionate teenagers have made through the direct and positive way they confront challenges, I feel energized and compelled to follow their example. The students took us on a bus tour as they pointed out areas of hope, challenge, and pride throughout Detroit. I particularly enjoyed visiting the Cadillac Urban Garden, another community beautification project that buildOn students help support. Above: Katherine poses for a picture with Robyn, her buildOn Student Ambassador during 36 Hours. Afterward, we began our second service project at the Detroit Rescue Mission where we served dinner to many experiencing food insecurity. It was fast-paced and challenging to keep up with the rush as wave after wave of people entered, but it was also deeply satisfying knowing that we had helped meet a basic and critical need for these men and women that day. We finished our 36 Hours at dinner in downtown Detroit where we shared highlights, affirmations, and hugs. A few flight delays later, I touched down in Rhode Island at 2:00am Wednesday morning. However, instead of being exhausted, I’m still flying high from my short time in Detroit. To Robyn and the other buildOn students and staff, thank you for taking us on this amazing journey. The impact you’ve made on me will surely last beyond the 36 hours we spent together. I will do my best to live up to your example and spread some of that southwest Detroit moxie and heart into my work every day. Together, we will continue to change the world. Below: Robyn and Katherine take a fun photo together before heading off to service during 36 Hours.